"Thanks for taking a moment to read about me! My name is Mitch." "I don't like to brag, but everyone here at Wayside has been talking about what a looker I am. I have to be careful, or it might go to my head! I'm a stunning, longhaired black cat with a gorgeous smoke colored mane and beautiful, expressive golden eyes. I have a cute little meow and a great purr. I was adopted from Wayside once before, but the family had children and a dog, and it was just too much stress and commotion for me. I need to be in a calm, quiet, stress-free home, and my wonderful personality will come shining through. Here at Wayside I'm becoming known as an affectionate, playful boy who loves batting at the feather wand. I enjoy attention and affection, but I prefer it on my own terms, and I'm not fond of being held. I do give great head butts! I like being petted, but I will let you know when I've had enough. At 8 years of age, I'm right in my prime, ready to be a mature, loyal companion. My Felineality is Sidekick. That means I'm moderately brave in new situations and I enjoy the company of people. Usually, I will want to be your side, but I'm not needy and I can entertain myself. 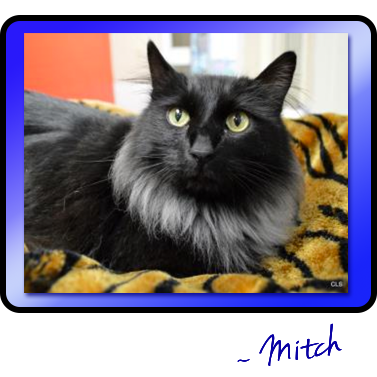 If you're looking for a beautiful boy kitty who turns heads and warms hearts, come to Wayside and ask for Mitch! Handsome Mitch is available at Allie's Alma Mater, Wayside Waifs. Mitch is so unique! My human would love to wake up to him every day! Fortunately, she can't come up and meet him in person! What a beautiful silver mane you have, Mitch! We hope you don't have to wait long for your furrever family. I too love that mane! What a handsome boy you are Mitch. Handsome Mitch I hope the right furever home finds you soon!